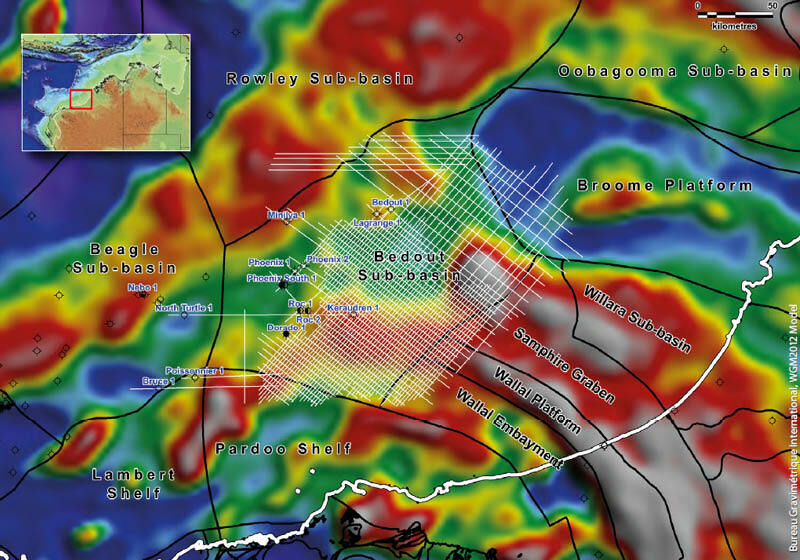 Recent petroleum discoveries, including the Dorado-1 well, in the Bedout Sub-Basin indicate a promising future for the hydrocarbon prospectivity of offshore Western Australia. Figure 1: Bilby survey data (white lines) and structural elements of the Offshore Canning Area (black lines) overlaying the free-air gravity anomaly (relative highs in whites/reds, lows in blue). Bureau Gravimétrique International, WGM2012 Model. The recent oil, gas and condensate discoveries in the Bedout Sub-basin of the Roebuck Basin have caused a change in thinking in this hitherto underexplored region. In 2014 Phoenix South-1 discovered oil, closely followed in 2015 by Roc-1 (gas and condensate) and in 2018 by Dorado-1 (oil). These discoveries targeted reservoirs in the Triassic Lower Keraudren Formation (Fm) that are older than the traditional Triassic plays on the North West Shelf (Figure 2; Thompson et al., 2018). These achievements are helping remedy the historically poor understanding of this region and now stand as analogues for further lookalikes. 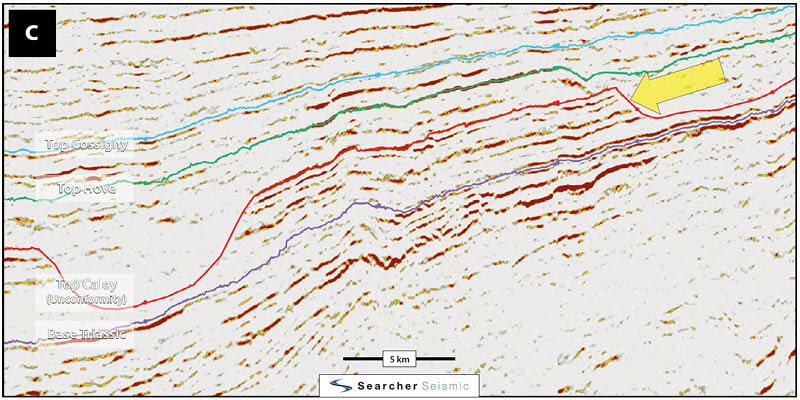 Searcher Seismic’s modern Bilby Non-Exclusive 2D Seismic Survey acquired long-offset, high resolution seismic in this area, providing high-quality data to help identify prospective stratigraphic and structural trends. It also ties the recent hydrocarbon discoveries and generally sits inboard of them (Figure 1). The Bilby data addresses multiple issues with the vintage data in the area by using an 8 km streamer with improve frequency response, a larger source array to improved signal penetration, and a broadband anisotropic PSTM processing workflow. Integration of the recent discoveries with regional geology, this new data, and geophysical quantitative interpretation (QI) techniques suggest that the entrapment and sealing mechanisms are the key elements to understanding the region’s petroleum systems. The Bilby data reveals several potential reservoir-seal pairs in the Mesozoic strata, as well as deeper Palaeozoic character, much of which has been previously assumed not to be present and was unimaged to date (Figure 2) . This article discusses both the underexplored Mesozoic and unexplored Palaeozoic hydrocarbon potential in the area. Figure 2: Generalised stratigraphy of the Bedout Sub-basin. Note: a) Lower Keraudren Fm (yellow star); b) absence of Carboniferous and Devonian stratigraphy; and c) general thick homogeneity of units that may contain interbedded facies (e.g. Jurassic Depuch Fm). Modified after Geoscience Australia. Early Triassic sedimentation in the region is dominated by the Locker Shale, grading upwards into the Lower Keraudren Fm, which is dominantly fluvio-deltaic with interbedded low energy organic-rich lagoonal to higher energy facies. The Lower Keraudren Fm’s differing characteristics mean that it can be subdivided into eight informal units, of which the Caley Sandstone has emerged as the key reservoir (Woodward et al., 2018). This was most recently shown in Dorado-1 where it displayed excellent reservoir and fluid characteristics in highly porous (~20%) and permeable (100 to 1,000 mD) sands. Further evaluation demonstrates that Dorado is one of the largest oil discoveries in the history of the North West Shelf (Carnarvon Petroleum, 2018). The cyclical sedimentation of the Lower Keraudren Fm implies that the potential for several source, reservoir and seal opportunities exist (Thompson et al., 2018). Prior to the Dorado-1 oil discovery, one major source rock interval of lagoonal facies origin had been intersected within the Caley Member (Woodward et al., 2018). However, deeper drilling in Dorado-1 encountered additional oil discoveries such as stacked plays in the older Crespin and Milne Members (Carnarvon Petroleum, 2018). At the unconformable Caley-Hove boundary, several large incision canyons have cut into the shelf, some of which are over 500m (Minken et al., 2018). These canyons were later filled with the laterally continuous, fine-grained, hemipelagic shale Hove Member that provides a regional seal, as found at Dorado-1. Prior to drilling Dorado, the structural-stratigraphic trap was perceived to be high risk as the features unequivocally relied on sealing facies (i.e. Hove Member) to be present in the large incised canyon. 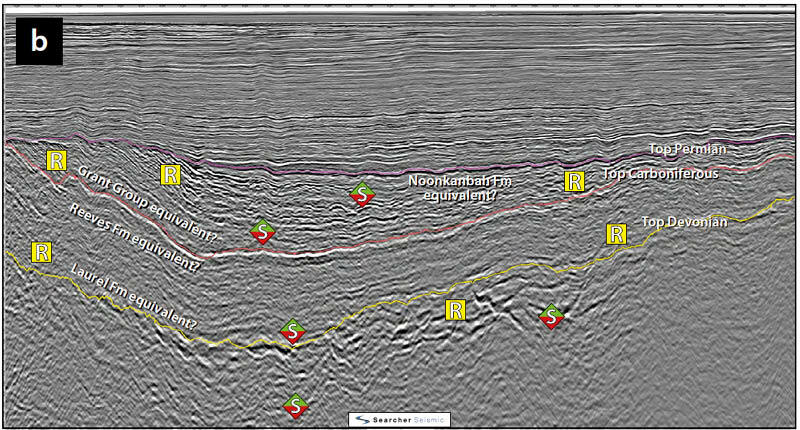 Like Dorado-1, exploration success relies on good quality seismic data for delineation of prospects in relation to trapping mechanisms, sealing capacity (top, base and lateral), as well as reservoir presence and quality. 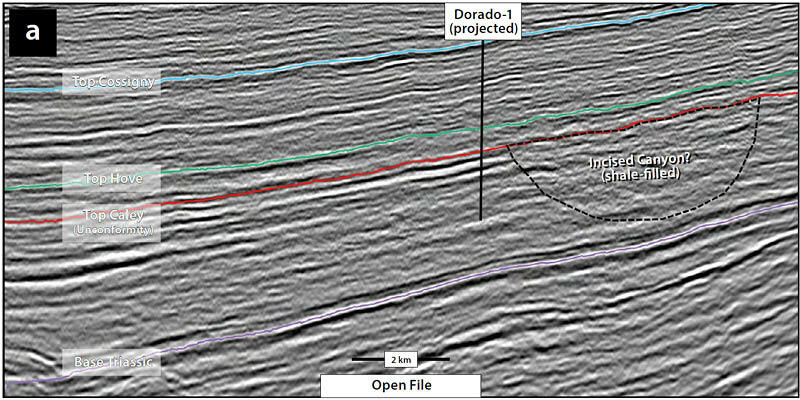 Review of the vintage open file seismic data demonstrates that the canyon geometry of Dorado is not obviously evident (Figure 3a). However, the Bilby data provides a high-quality image to help identify similar prospective trapping mechanisms across the region (Figure 3b). Figure 3: Dorado-1 in the vintage 2D seismic data and lookalikes in the Bilby data. a: The incised canyon is not apparent on the open file 2D seismic. b: Clear definition of geometry of an example incised canyon in the Bilby data. c: Amplitude variation with angle (AVA) acts as lithology indicator for the main Caley reservoir (reds) and the Hove seal (nothing). 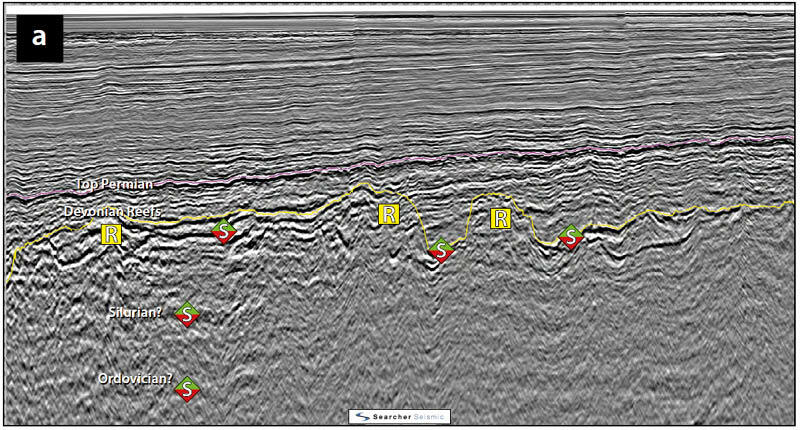 Here the AVA attributes suggest the presence of good multi-layer stacked reservoir in the Lower Keraudren Fm sands highlighted by the yellow arrow. ‘S’ means potential source; ‘R’ means potential reservoir. The Caley Sandstone at Roc-1 exhibits a class 2p AVO response (Woodward et al., 2018), which warrants similar seismic investigations in the area. The Bilby data enables a robust lithology discrimination through QI techniques. Figure 3c demonstrates Dorado lookalike features where lithological content of both reservoir and seals can be discriminated through AVA attribute analyses (which can be extrapolated across the region). The presence of multiple source and reservoir-seal pairs in the Lower Keraudren Fm and the proven stratigraphic trapping mechanisms provide encouragement to further examine the Triassic hydrocarbon potential elsewhere in the area. 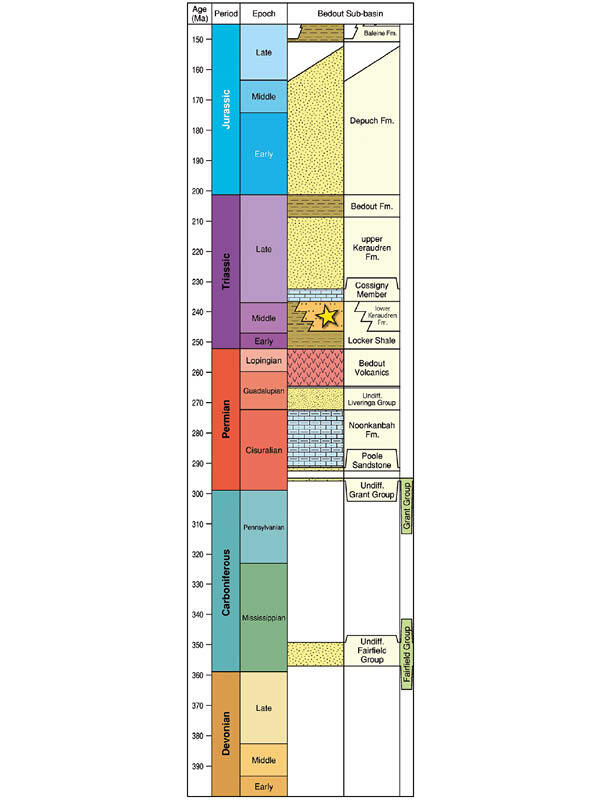 The Palaeozoic sequences for the region are best described from the Onshore Canning Basin where they are over 11,000m thick in the Fitzroy Trough, thinning to <5,000m on the Broome Platform. Figure 4: Palaeozoic character and potential observed in the Bilby data (depth). a: The offshore extension of the Devonian Reef complexes. b: Generalised Palaeozoic character highlighting the Devonian, Carboniferous and Permian sedimentary sequences. The Laurel Fm, Reeves Fm, Grant Group and Noonkanbah equivalents highlighted remain untested in the area. ‘S’ means potential source; ‘R’ means potential reservoir. The oldest sedimentary sequence known in the Canning Basin is the Early Ordovician to Silurian (Figure 5). Above the Base Devonian unconformity, the megasequence includes a Late Devonian syn-rift succession comprising an Upper Devonian Reef complex. The onshore Blina oil field was discovered in 1981 in an Upper Devonian Reef complex and Playford (1982) hypothesised that these reef complexes also exist offshore. The vintage seismic data in the area is plagued with short streamer lengths, so imaging of the Palaeozoic is nonexistent. With an 8 km streamer, the Bilby data has imaged what is believed to be the offshore extension of the Devonian Reef complexes that potentially sit in the oil window (Figure 4a), which warrant further investigation. Figure 5: Generalised Palaeozoic stratigraphy of the Onshore Canning Basin is from Haines et al. (2013). The red stars in the stratigraphic chart denote the plays that hypothetically extend offshore and are discussed in the text. The Carboniferous Laurel Fm, consisting of carbonates and shoreface clastics overlain by marine carbonates and shales, hosts most of the oil and gas occurrences on the Lennard Shelf. From a geochemistry perspective, the Lower Carboniferous looks ambiguous with fair-to-good total organic carbon readings (Ghori, 2013), although it is prospective (Kingsley and Streitberg, 2013). Offshore, the Carboniferous (and older) is generally assumed not to be present over much of the area (Figure 2). However, Carboniferous character is observed offshore in the Bilby seismic (Figure 4b), suggesting that this data can therefore answer questions about the extension of the Laurel Fm into the area. The sedimentary sequence overlying the Carboniferous unconformity consists of the Reeves Fm, the fluvial and glacigenic Grant Group, and the Noonkanbah Fm marine shale. 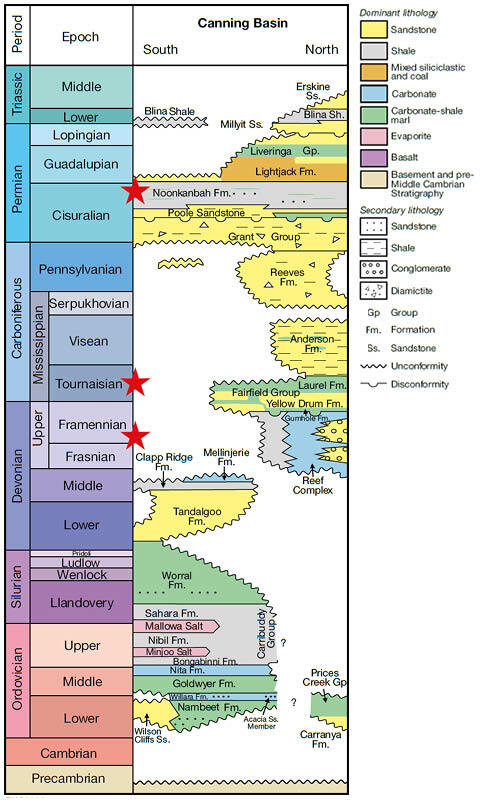 Organically-rich marine shales within the upper Grant Group are the main source rock interval within the Upper Carboniferous and Lower Permian onshore. Moreover, the Permian Noonkanbah Fm has demonstrated good source potential onshore although it is immature (Mory, 2010). Noonkanbah and Grant Group character is observed offshore on the Bilby data (Figure 4b) and is found at a deeper level than is observed onshore and is therefore potentially more mature in the offshore section. The deeper Palaeozoic potential in the region has also been overlooked due to a lack of understanding of the petroleum systems and a paucity of seismic data. The recent Triassic discoveries as well as the Palaeozoic play potential is fundamentally changing the ‘moose pasture’ status of the Offshore Canning Area into true elephant hunting ground! Apak, S.N. and Backhouse, J. (1998). Re-interpretation of the Permo-Carboniferous Succession, Canning Basin, Western Australia. In: Purcell P.G. and Purcell, R.R. (eds), The Sedimentary Basins of Western Australia 2. Proceedings, PESA Symposium, Perth, Pages 667-682. Carnarvon Petroleum (2018a). Dorado-1 Oil Discovery. ASX Announcement, 18 July 2018. Carnarvon Petroleum (2018b). RIU Good Oil Conference Presentation, 2018. Carnarvon Petroleum (2018c). More oil confirmed in Dorado-1 well. ASX Announcement, 8 August 2018. Ghori, K. A. R. (2013). Petroleum geochemistry and petroleum systems modelling of the Canning Basin, Western Australia. Geological Survey of Western Australia, Report 124. Haines, P. W., Wingate, M. T. D. and Kirkland, C. (2013). Detrital Zircon U–Pb Ages from the Paleozoic of the Canning and Officer Basins, Western Australia: Implications for Provenance and Interbasin Connections. West Australian Basins Symposium, 2013. 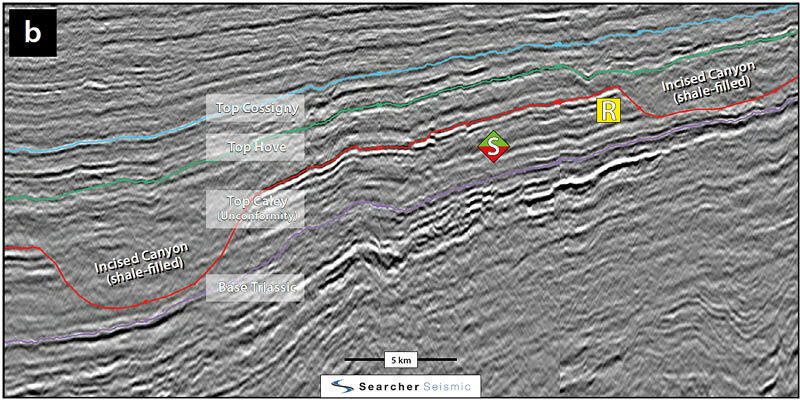 Insight Petroleum and Searcher Seismic (2015). Prospectivity Study of the Offshore Canning Area, Western Australia. Kingsley, D. and Streitberg, E. (2013). The Exploration History of the Laurel Basin-Centred Gas System Canning Basin, Western Australia. West Australian Basins Symposium, 2013. Minken, J., Thompson, M., Woodward, J. and Fabrici, R. (2018). Tectonostratigraphic framework of the Lower Keraudren Formation, Bedout Sub-Basin: interplay of tectonics and sedimentary systems. The APPEA Journal 58(2), doi:10.1071/AJ17170. Mory, A. J. (2010). A review of mid-Carboniferous to lower Triassic stratigraphy, Canning Basin, Western Australia. Geological Survey of Western Australia, Report 107. Playford, P. E. (1982). Devonian reef prospects in the Canning Basin: implications of the Blina oil discovery. The APPEA Journal 22(1), doi:10.1071/AJ81021. Smith, S. A. (1999) The Phanerozoic Basin-Fill History of the Roebuck Basin. PhD Thesis, Australian School of Petroleum, University of Adelaide. Thompson, M., Wehr, F., Woodward, J., Minken, J., D’Orazio, G., Fernandes, F., Kongowoin, M., Hansen, L., Kuek, D. and Fabrici, R. (2018). Recent exploration results in the Lower Triassic, Bedout Sub-basin: Australia’s next petroleum province? The APPEA Journal 58(2), doi:10.1071/AJ17165. Woodward, J., Minken, J., Kongawoin, M., Hansen, L., Thompson, M. and Fabrici, R. (2018). The Lower Triassic Caley Member: depositional facies, reservoir quality and seismic expression. The APPEA Journal 58(2). doi:10.1071/AJ17172. Recommended GEO ExPro articles relating to, or similar in content to, hydrocarbon exploration and the geology of Australia. After several low years of oil and gas exploration activity in Australia, it looks as though drilling potential is picking up. Book Review - "Shaping a Nation: A Geology of Australia". Geoscience Australia, 2012, Richard Blewitt, Chief Editor, 571 pages. With recent oil discoveries potentially exceeding 10 Bbo, independents and their partners are opening up plays that could reshape exploration in a large portion of the Arctic. Significant discovery and appraisal in The Netherlands with 24m net interval of high permeability sands in the Permian Lower Rotliegendes.